Modern society is plagued by fragmentation. The various sectors of our communities--businesses, schools, social service organizations, churches, government--do not work together. They exist in their own worlds. As do so many individual citizens, who long for connection but end up marginalized, their gifts overlooked, their potential contributions lost. This disconnection and detachment makes it hard if not impossible to envision a common future and work towards it together. We know what healthy communities look like--there are many success stories out there, and they've been described in detail. 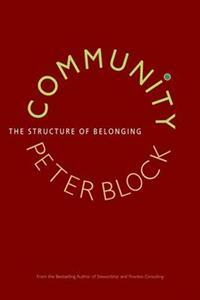 What Block provides in this inspiring new book is an exploration of the exact way Community can emerge from fragmentation: How is Community built? How does the transformation occur? What fundamental shifts are involved? He explores a way of thinking about our places that creates an opening for authentic communities to exist and details what each of us can do to make that happen.